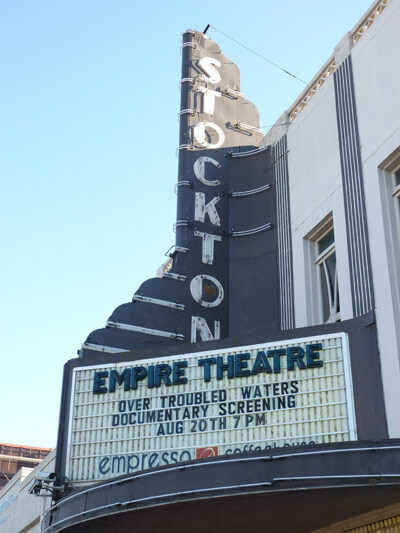 A crowd of over 350 people turned out for the Stockton premiere of Restore the Delta's "Over Troubled Waters" documentary at the Empire Theatre on Monday, August 20. "We are planning a second screening in September for those who couldn't get a ticket," said Barbara Barrigan-Parrilla, Executive Director of Restore the Delta. "Thank you to all our loyal supporters, and thank you to Caleen Sisk from the Winnemem Wintu Tribe, Congressman Jerry McNerney, Supervisor Larry Ruhstaller, Assemblymember Bill Berryhill, Mayor Ann Johnston, and Council Member Susan Eggman for speaking, leading, and uniting our communities for the fight at hand." Reporter Alex Breitler covered the event in the Stockton Record. The next screening of "Over Troubled Waters" will take place Aug. 28 in Los Angeles at the Landmark Theater at 7:00 p.m. There will be a special appearance by Ed Begley, Jr. However, Restore the Delta is hoping to have another screening in Stockton, as well as showings in Fresno and the Bay Area. For more information is avaialable here. "Over Troubled Waters," a documentary about the Sacramento-San Joaquin Delta, premiered in Sacramento on Wednesday, August 8 at the Crest Theater. U.S. Representative George Miller joined hundreds of sustainable water policy advocates at a news conference prior to the film premier, the centerpiece of a public education effort to stop the building of peripheral tunnels. In what the group describes as a "visually rich documentary," Ed Begley Jr. narrates the story of how the people of the Delta are fighting to protect the region they love and to encourage saner, sustainable water policies for all the people of California. During the Sacramento screening U.S. Rep. George Miller (D-Martinez), the first recipient of the organization's "Delta Advocate" award and the author of the Central Valley Project Improvement Act of 1992, presented Wolk with this year's "Delta Advocate" award. Wolk received the award two weeks after she spoke at a rally at the State Capitol challenging Governor Jerry Brown's plan to build a 37-mile Peripheral Tunnels project. Brown's plan would divert the Sacramento River to Southern California with two large underground "peripheral tunnels" that are expected to hasten the extinction of Central Valley salmon, Delta smelt and other fish species. The massive public works project proposed under the Bay Delta Conservation Plan (BDCP) is estimated to cost between $21 billion and $47 billion or more.